Who else totally called it? 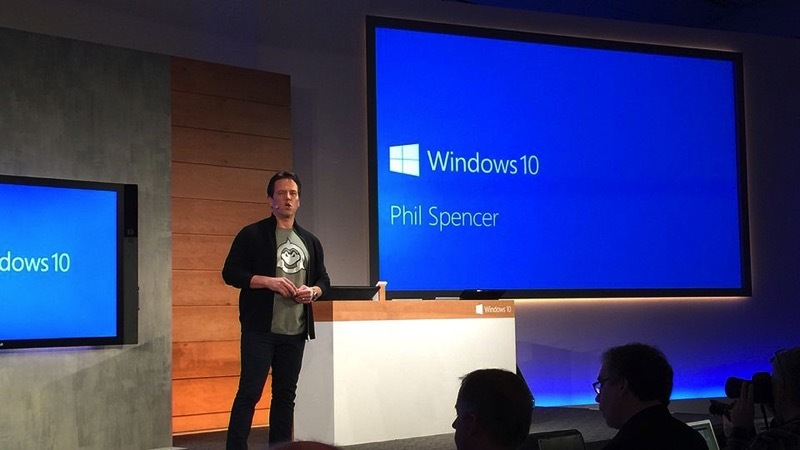 Microsoft is all about Windows 10 tonight, but there was a little time for Xbox boss Phil Spencer to talk bout how the new operating system will affect PC gaming, and more importantly Xbox One gaming. And it’s about bloody time that Xbox and PC gamers are finally going to be able to play online with each other. Using Fables Legends as an example (which is coming to PC as well now), Microsoft revealed a new feature that will be available on Windows 10: cross-platform play. Phil Spencer was able to join a co-op game of Fable via the PC, while the other player ran the game on Xbox One. Right now this is the only game with this functionality confirmed, but since it’s embedded in the OS it could reach every single game on both platforms. But Spencer wasn’t done there. What about playing Xbox One games on PC? That’s now possible thanks to Windows 10 as well, with the Xbox One able to stream every single game to any Windows 10 device over a network. That includes PCs, tablets and phones, which gives an unreal amount of flexibility to your streaming options – especially since nearly everyone is on Windows in some capacity. All of these features will become available when Windows 10 launches on both PC and Xbox One. Update: Microsoft has confirmed that streaming will only work on one device at a time, and only via WiFi on a local network. Microsoft has also stated that games will have to specifically support the feature. Previous article Who would win between Fallout and Skyrim?